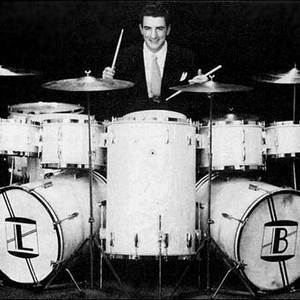 Luigi Paulino Alfredo Francesco Antonio Balassoni, who performs as Louie Bellson, was an American jazz drummer. He is one of the few jazz drummers to be considered a worthy rival for Buddy Rich. Regarded by Duke Ellington as "the world's greatest drummer", Bellson was a composer, arranger, bandleader and a tireless jazz educator who pioneered the use of two bass drums, and in terms of the speed of his hands and feet and the wonderful, percussive "ideas" he conveys on the drums, stands next to only Buddy Rich as the total technician. Regarded by Duke Ellington as "the world's greatest drummer", Bellson was a composer, arranger, bandleader and a tireless jazz educator who pioneered the use of two bass drums, and in terms of the speed of his hands and feet and the wonderful, percussive "ideas" he conveys on the drums, stands next to only Buddy Rich as the total technician. Referred to by Leonard Feather as "one of the most phenomenal drummers in history," Louie Bellson has expressed himself on the drums since he was three years old. At 15, he pioneered the double-bass-drum set-up. His detailed sketch earned him an 'A' in his high school art class. At 17, he triumphed over 40,000 drummers to win the Slingerland National Gene Krupa contest. As an internationally-acclaimed artist, he performed in most of the major capitals around the world. With the exception of Bob Hope, who has made the most White House appearances, Bellson holds, along with his late wife Pearl Bailey, the second highest number of White House appearances. He performed and/or recorded scores of albums (approximately 200) as a leader, co-leader or sideman with such greats as Duke Ellington, [artist[Count Basie, Benny Goodman, Tommy Dorsey, Harry James, Woody Herman, Norman Granz' J.A.T.P., Benny Carter, Sarah Vaughan, Ella Fitzgerald, Oscar Peterson, Art Tatum, Dizzy Gillespie, Gerry Mulligan, Stan Getz, Hank Jones, Zoot Sims, Sonny Stitt, Milt Jackson, Clark Terry, Louis Armstrong, Lionel Hampton, Eddie "Lockjaw" Davis, Shelly Manne, Billy Cobham, James Brown, Sammy Davis Jr., Tony Bennett, Pearl Bailey, Mel Torme, Joe Williams and Wayne Newton. Over the years, Louie has taken several bandleader's holidays to play under the direction of other leaders or to lead someone else's band. During the '60s, he rejoined Ellington for his Emancipation Proclamation Centennial stage production, "My People", the motion picture soundtrack of "Assault on a Queen," and for what Ellington called "the most important thing I have ever done"?his Concerts of Sacred Music. In 1966, Louie toured briefly with both Basie and ex-boss Harry James. A few years later, Buddy Rich paid Louie the supreme drummer-to-drummer/bandleader compliment. Rich asked Bellson to lead his (Buddy's) band on tour while he was temporarily disabled by a back injury. Louie proudly accepted. In 1942, he performed with the Benny Goodman band and Peggy Lee in "The Power Girl", the first of his many film appearances. Louie was 24 and a veteran of a U. S. Army band when he joined Danny Kaye, Louis Armstrong, Tommy Dorsey, Lionel Hampton, Charlie Barnett, Benny Carter, Mel Powell, Kenny Dorham, Harry Babasin, Al Hendrickson, Buck Washington, and Goodman for Howard Hawks' "A Song Is Born," still a recurring treat on TV's late, late shows. As a prolific creator of music, both written and improvised, his compositions and arrangements (in the hundreds) embraced jazz, jazz/rock/fusion, romantic orchestral suites, symphonic works and a ballet. Little known to many of his listeners, the versatile Mr. Bellson was also a poet and a lyricist. As an author, he published more than a dozen books on drums and percussion. Bellson's numerous accolades are legion. He was voted into the Halls of Fame for both Modern Drummer magazine and the Percussive Arts Society. Yale University named him a Duke Ellington Fellow in 1977. He received an honorary Doctorate from Northern Illinois University in 1985. He performed his original concert, Tomus I, II, III with the Washington Civic Symphony in historic Constitution Hall in 1993. He received the prestigious American Jazz Masters Award from the National Endowment for the Arts in 1994. Additionally, Louie Bellson is a four-time Grammy Award nominee. In addition, The London Suite (recorded in his album, Louie in London) was performed at the Hollywood Pilgrimage Bowl before a record-breaking audience. The three-part work includes a choral section in which a 12-voice choir sings exquisitely sensitive lyrics by Bellson. Part One is the band's rousing Carnaby Street, a collaboration with Jack Hayes. Critic Leonard Feather has enthused, "Musicians and public alike respect him as a drummer without peer in technique, taste and originality; and as a composer whose works are a consistently effective fusion of melodic, rhythmic and harmonic ideas." Bellson led his own orchestra almost steadily for more than forty years. In his Big Band Explosion, there was zest, humor, fervor and exultation. One of his former employers understands. The distinguished Duke Ellington said, "Louie Bellson has all the requirements for perfection in his craft." Bellson received his Doctor of Humane Letters in 1985 at Northern Illinois University. In 1987, at the Percussive Arts Society convention in Washington, D. C., Bellson and Harold Farberman performed a major orchestral work titled, Concerto for Jazz Drummer and Full Orchestra, the first piece ever written specifically for jazz drummer and full symphony orchestra. This work was recorded by the Bournemouth Symphony Orchestra in England, and was released by the Swedish label, B. I. S.
Bellson was voted into the Halls of Fame for both Modern Drummer magazine and the Percussive Arts Society. In June 1993, he performed Tomus I, II, III with the Washington Civic Symphony in historic Constitution Hall. A combination of full symphony orchestra, big-band ensemble and 80-voice choir, Tomus had been a collaboration of music by Bellson and lyrics by his late wife, Pearl Bailey. In January 1994, Bellson received the prestigious American Jazz Masters Award from the national Endowment for the Arts, a federal agency. As one of three recipients, Bellson was lauded by NEA chair Jane Alexander who said, "These colossal talents have helped write the history of jazz in America." Whether big band or small, whether at colleges, clubs or concert halls, Bellson maintained a tight schedule of clinics and performances. In between, he continued to record and compose, resulting in more than 100 albums and more than 300 compositions to date. Bellson's Telarc debut recording, Louie Bellson And His Big Band: Live From New York, was released in June of 1994. He also continued to create new drum technology for Remo, Inc., of which he was vice president. Between 1943 and 1952, Bellson performed with Benny Goodman, Tommy Dorsey, Harry James, and Duke Ellington (for whom he wrote "Skin Deep" and "The Hawk Talks"). In 1952 he married Pearl Bailey and left Ellington to be her musical director. Later in the 1950s and 60s he performed with Jazz at the Philharmonic, Tommy and Jimmy Dorsey, Count Basie, Ellington again, and James again, as well as appearing on several Ella Fitzgerald studio albums. In 2006, Mr. Bellson released a CD entitled ?The Sacred Music of Louie Bellson and the Jazz Ballet.? On February 14 2009, Louie Bellson died unexpectedly.